Ingredients: Non-GMO Food Grade Oils of Sustainable Palm and Coconut, Water, Sodium Hydroxide*, Organic Cornmeal, Organic Polenta, Glycerine, Fragrance Blend with Natural Plant Extracts and Essential Oils, Mineral Pigment and/or Annatto Seed for color. Characteristics: Scrubs the Hell out of you while exfoliating all that nasty days grime. Hockey buck size fits great in your hand. Qualities: All Natural and Great price. SoapQuest Review: Once again another great soap by Sappo Hill. The Gardeners’ Lemon is probably one of the best scrub soaps around. This one is so so so packed with corn meal and polenta that you won’t believe how much a rough scrub can actually feel so good. The lemon scent is subtle and that is a good thing because when citrus flavored soaps are to strong they smell like Mr. Clean which really isn’t pleasant at all. 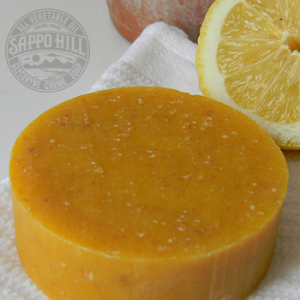 Sappo Hill Soaps are made with All natural ingredients and my skin thanks me every time I use it. Description for Gardeners’ Lemon Soap from Sappo Hills website: Why not enjoy washing your hardworking hands? Tired fingers and palms chafed by gloves or weather are soothed into happiness by the rich lather that grows ever more luscious as our round Gardeners’ bar revolves in your hands. Its cleansing power is aided by organic grains of polenta and cornmeal. These exfoliants gently stimulate skin while leaving a hint of lemon behind, along with the natural glycerine we leave in for extra softness. Get dirty, then get clean!